Throughout history, artists and sculptors have molded, fired, and glazed clay to form a myriad of items, from ancient urns to your daily coffee mug. Possibilities for creativity within this medium seem as endless as the countless pottery pieces collected over time. As interesting as some of these pieces are, I’ve recently been exploring the genre of art deco pottery — and especially, art deco pottery vases. The process of making pottery can be as simple as molding wet clay and baking it. However, the artisans of the art deco era had many other advanced techniques to utilize in making their pieces completely unique. First, let’s consider the three major types of pottery. Earthenware – the most organic, “natural” type of pottery. imagine ancient peoples using clay dug from the earth to form mugs, pots, tables, etc. and heating the molded item over a hot hot flame until it dried or set. In more modern days, Earthenware meant for domestic use had to be glazed to seal the porous surface. Stoneware — very simply, the hotter the flame, the harder and more solid the clay becomes. People noticed that when they used high high heat when curing their pottery, the item became almost as hard as a stone, hence the name stoneware. Stoneware needs no glaze since the surface is considered non-porous and therefore waterproof. Pottery meant for use in human consumption nowadays will most likely be stoneware; however, it still maintains the look of organic earthenware without the glaze. Porcelain — the Chinese found that by adding a feldspathic material (material containing feldspar, a naturally-occurring element composing almost 60% of the earth’s crust) to their clay when making stoneware, they created a white paste. This white paste, when fired, can either take on a smooth, shiny, almost glassy appearance or a slightly translucent form that is usually glazed with a lead-based glaze. The latter of these two became widely used and revered among Europeans during the 1700’s. No matter the type, the skill and experience of the artisan comes into play when choosing the most perfect firing temperature. More valuable pieces will have been treated with the correct flame and the most careful temperature judgment. In the early 20th century, commercial advances and the industrial revolution introduced the ability to mass-produce pieces, resulting in a decline in original true works of art pottery. However, during the Great Depression and the early 1930’s, artist-potters in Western Europe and the United States revived the ancient forms of Japanese and Chinese potters and began experimenting with new materials and clay composition. In other words, many pottery pieces (including art deco pottery vases) were made in small or singular batches, resulting in more valuable and artistic collectors’ items. Part II will discuss the aesthetics of art deco pottery, including the use of shape, color, texture, design,glaze and paint, and how these artistic elements reflect the trends of the day. http://ezinearticles.com/?Art-Deco-Pottery—10-Influences&id=4834082 — I found this very helpful. Enjoy! Art Deco v. Art Nouveau — How Do I Know? I found the nearest clerk and inquired about the piece. The clerk told me that the piece dated from “around the turn of the 20th Century”, and featured ”Art Deco Styling”. Hmmm…red flag. Why, you ask? Experts agree — Art Deco Style directly descended from the globalization of the artistic and home decor markets, mostly because of a resurgence in American interest in French (and other European) trends across the creative arts. If you have visited French cities like Montmarte (where the foreign language film Amelie takes place), I’m sure you noticed the types of painting reproductions sold in local shops, mostly conceived by the famous French artist Henri Toulouse-Lautrec. Toulouse-Lautrec was an “archetypal bohemian artist” who lived in Montmarte (a Parisian suburb) and created Impressionist art during the belle époque, or “beautiful era” of Paris, roughly during the 1890′s. Henri is best known for his dancing, flowing female forms, and often painted advertisement posters for the infamous cabaret, Moulin Rouge (from which he painted this scene, and one of his most revered works). This style is considered Art Nouveau. The Impressionists during the late 19th Century celebrated not only a strong feminine aesthetic, but the forms of flowering blooms and other natural elements (remember Monet’s Lilypads, Renoir’s Sisters at a Piano, etc). The pastel, almost cloudy and soft nature of the Impressionists bled into Art Nouveau pottery, glasswork, and architecture easily, and the the genre names are considered somewhat interchangeable. 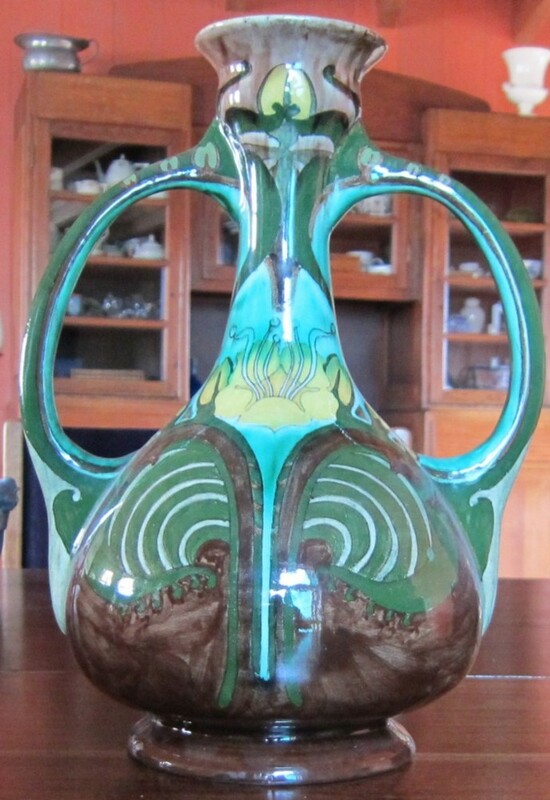 I’m sure you can see the subdued colors and sweeping, feminine curves indicated by the vase pictured above, and several obvious nods to nature. So, back in the antiques shop in Austin, I politely corrected the store clerk. I was pretty sure that the vase in question pre-dated the Art Deco era by at least 10 years, using the above argument. However, the store clerk was still not convinced. No worries! I asked the clerk to turn the vase over, so we could look for a “born-on date”. With pottery vases, this is rather easy to find, usually, and sure enough — there it was. My proof. Art Deco didn’t officially begin until the 1920′s, and flourished from the Great Depression until WWII. The name comes from the 1925 Exposition “Internationale des Arts Décoratifs et Industriels Modernes” which featured the new high-end Parisian ”style moderne”. Artists during this time shied away from the Impressionistic, soft florals and pastels of the Art Nouveau period and instead, began embracing Cubism, Futurism, and Neo-Classisism styles. As interesting as I found this particular vase, I passed it by since it didn’t meet my particular criteria. The store clerk actually thanked me for the information and offered to take down my email if she saw anything come in that might interest me — which makes my quest for great Art Deco pieces that much easier. Question 1: Is the overall shape geometric (square, oval, round, angular)? Question 2: Are the colors bold or solid (no pastels)? Question 3: Is the overall design modern, industrial, and / or ”futuristic” (not soft, whimsical, and feminine)? Question 4: Is there a “born-on-date” that shows a year between 1920-1945? If the answers to all of these questions is YES, then you’ve found yourself a piece of Art Deco history! I’d love to hear some of your stories. Please leave a personal shopping experience in the comments below. Enjoy, and good luck!